Designed to be the best performing drinking water filter on the market. 2-Stage Under Counter Water Filter - Chrome is rated 4.5 out of 5 by 842. Replacements engineered for ease. No need to disconnect hoses or water lines. 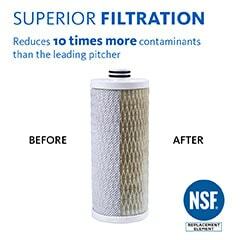 Eco-friendly filter housing easily twists off so replacing your filters is a snap! One Aquasana Claryum® filter gives you 12x the capacity of the leading gravity-based pitcher at only 10¢ per gallon with Water for Life. 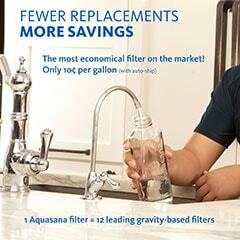 The Aquasana AQ-5200 alerts you when it's time to change your filters. No more guessing if and when you need to replace your old filters. Filter lasts up to 6 months and features easy twist-off design. 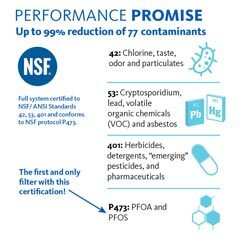 Full system tested and certified to NSF/ANSI Standards 42, 53, 401 + P473 for the claims specified on the Performance Data Sheet. Rated 5 out of 5 by Handyman5859 from Perfect for my needs! 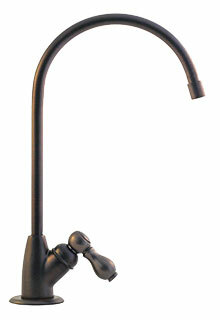 Straightforward, easy install for a separate drinking water faucet at the kitchen sink. Filter assembly fit perfectly in the space available, and provided tubing was enough to get the filter out close enough for easy filter changes. Very happy with the filter and service. Excellent product info and support available on website. 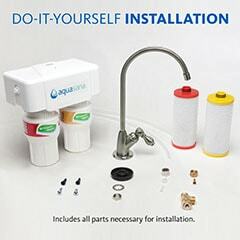 Rated 5 out of 5 by Scout from Easy to install We have enjoyed our new Aquasana water filter system. Our local water often had high chlorination levels which really affected the taste of our water. Our filtered water tastes fantastic. Rated 5 out of 5 by Larry M. from Clean water at my sink. I am enjoying the clean water in my kitchen. We now do all our coffee, tea, soup, and pasta boiling with clean water from our Aquasana filter. It was so easy to install. Just followed the directions. My wife really likes it. Rated 5 out of 5 by Kitchen helper from Aquasana filter: nice The filter init was delivered on time; fairly easy to install and is working fine. It fits into the overall scheme of the sink/counter/ kitchen very nicely. Rated 5 out of 5 by rwdw from great tasting water two stage under counter water filter is excellent product and filters water as advertised and as recommended on many reviews. easy install. Rated 5 out of 5 by Teach from Overall impression of our Aquasana Our water tastes great! We love our Aquasana water filter!! Rated 5 out of 5 by Speedie from Aquasana a very nice product. Fits perfect under my kitchen counter.Faucet looks great.Water taste wonderful ,no odor. Our under counter drinking water filter systems are very easy to install, and it only takes a few minutes to do; no plumber is necessary. If you have any questions or need assistance, our technical support representatives at 866-662-6885 can walk you through the installation process. We recommend replacing the cartridges after six months or the specified gallon capacity to prevent the growth of bacteria in the system. The AQ-5100 Single Stage has a capacity of 200 gallons, the AQ-5200 Two-Stage has a capacity of 500 gallons, the AQ-5300 Three-Stage has a capacity of 600 gallons and the AQ-5300+ Three-Stage has a capacity of 800 gallons. Replacement filters cost $29.99 for the AQ-5100, $59.99 for the AQ-5200, $64.99 for the AQ-5300 or $79.99 for the AQ-5300+, but you can save 15%, get free shipping, and extend your product warranty by signing up for our no-contract auto-ship filter replacement program, Water for Life. The performance indicating device on the AQ-5200, AQ-5300 and AQ-5300+ systems will sound a beeping alarm and flash red when it is time to change your cartridges. The AQ-5300+ also contains Bluetooth connectivity so you can download our iPhone App and get alerts for when it is time to change your cartridges and even order new replacements straight from the App! We have designed this system to minimize the environmental impact of our replacement elements, which are over 95% biodegradable carbon. Our company will recycle the filters for you, but we do not cover the shipping cost to return the filters back to us. In reality, the environmental impact of shipping the filters back to us outweighs the good of recycling. To recycle the drinking filters yourself, remove the ends of the filters, recycle the plastic parts (which are appropriately numbered) and put the carbon either in your compost pile or garden (carbon is good for plant life), or just throw it out (since the carbon degrades quickly, and is a positive component in a landfill). I'm a renter, so I can't drill or modify the plumbing. What should I do? To install an under counter system, you can remove the existing sprayer or soap dispenser on your sink and install our faucet in its place. This option will not damage or permanently modify your plumbing. When you move out, you can easily remove the system and reconnect your plumbing back to normal. 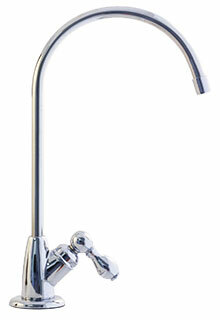 If you do not have an existing hole in your sink from a sprayer or soap dispenser, we also have a countertop drinking water filter that conveniently screws on to most kitchen faucets. What is the size of the brass T-fitting for under counter and premium under counter unit? The most common size is 3/8" which originally comes with the system purchase. In rare cases some customers may need a 1/2" T-fitting which is sold separately and is available for purchase through technical support. What size hole do I need in my sink for the under counter and premium under counter systems? The faucet that is included with our systems requires a 1/2" hole. What is the difference between the single-stage, 2-stage and 3-stage under counter systems? 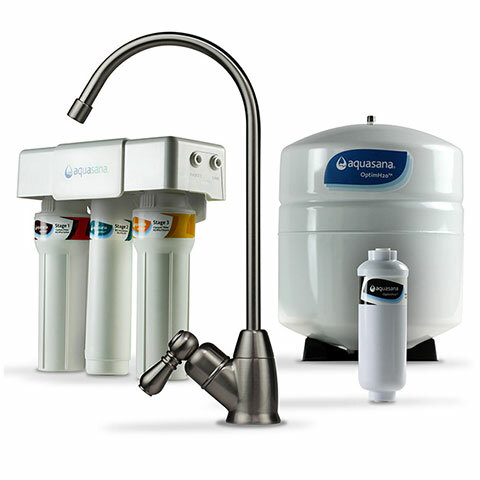 All of our drinking water systems use the same Aquasana Claryum® filtration technology. The single-stage system lasts 6 months or 200 gallons before the cartridges need to be replaced. 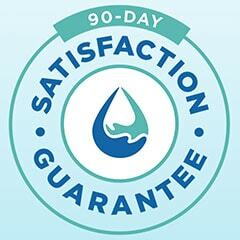 Our 2- Stage system has a higher capacity than the single-stage, giving you 6 months or 500 gallons of clean, filtered water. 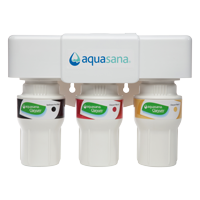 The 3-Stage system includes a 20 micron pre-filter before the two Aquasana Claryum® filters. This pre-filter increases the capacity of the system from 500 gallons to 600 gallons. In addition, it improves flow rate in high sediment areas. The 3-Stage Max Flow system adds even more capacity to 800 gallons, a 44% increase in flow rate at .72 gallons per minute and Bluetooth connectivity for filter tracking. I have an existing side faucet from a previous system. Can I use that with my new Aquasana water filter? We recommend that you use the faucet provided. 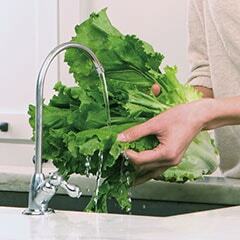 We have extensively tested the system with the faucets included. 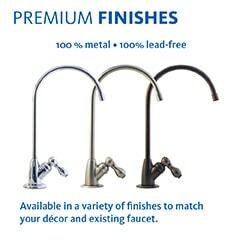 The faucets are NSF Certified to have no lead content. In addition, they will not impart any unwanted chemicals into your water. If you choose to use another faucet, we recommend that you have a plumber install the system to ensure no leakage occurs. 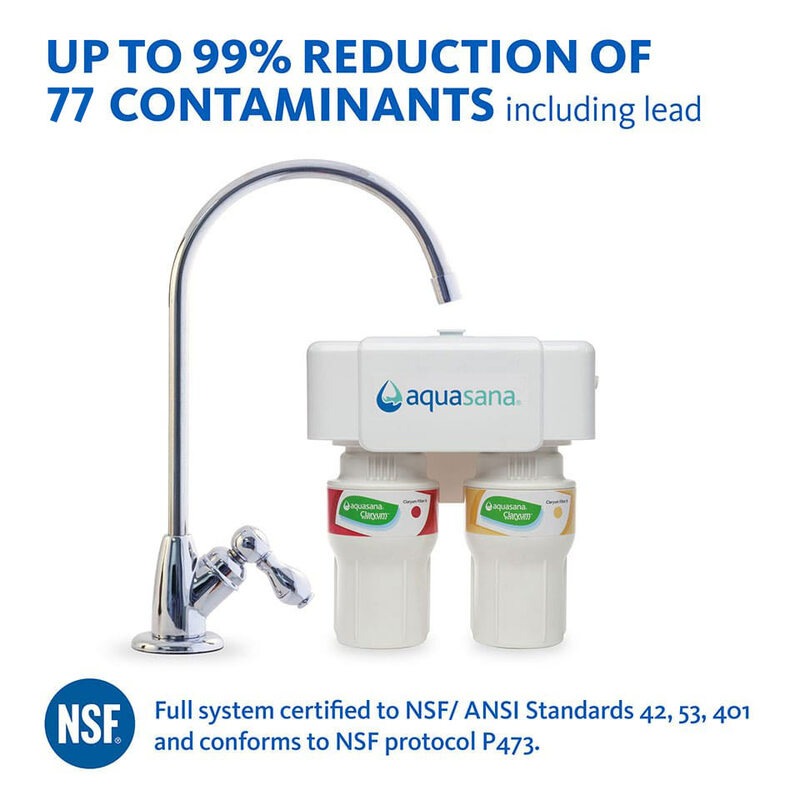 We also recommend that you install an NSF Certified faucet to ensure the health benefits of your new Aquasana water filter. Will the original hot/cold water faucet work as normal with the addition of the 2-stage water filter to the cold water line? We have well water from private well. &nbsp;Does under sink filter also work using well water. The water comes into your sink it can be connected to the well water and filtered. I understand this system reduces chlorine. Does it reduce fluoride? We have had the two stage under counter filter for a few years. Recently I hear a ticking clock type noise. What is this from, and can I correct it? Just installed a new 5200 2-stage filter. Pulled the battery tape out and now the filter is ticking and the red light is flashing. Called CS and they had me reverse the battery and put it back in. Solved the problem. CS also advised that in the future if we hear the ticking again it could mean a low battery. Can this filter system also be used to supply water to a refrigerator ice maker. I have under then counter AQ5200 - I accidentally inserted the the supply line into the out port, got stock and damaged the sleeve. How can I get a replacement? What is the smallest size particle ( in microns) that the two-stage under-counter filter will remove?